During the holiday season, finding really flavorful vegan recipes can be intimidating! But have no fear.......this dish will save you. I’m not sure how I will eat butternut squash any other way now! After reading the recipe, my first impulse was to peel the butternut squash before roasting it. I didn’t, though, following the instructions instead, and it turned out great. To avoid burning the onions, I roasted the squash and the onions in two separate pans. Heat the oven to to 425F. Put the squash and onions in a large bowl, add 3 Tbsp. of oil, a tsp. of salt and some black pepper, and toss well. Spread, skin down, on a baking sheet and roast for 40 minutes until the vegetables have taken on some color and are cooked through. Keep an eye on the onions: they may cook faster than the squash, so may need to be removed earlier. Remove from the oven and leave to cool. Put the tahini in a small bowl with the lemon juice, water, garlic and a 1/4 tsp. of salt. Start with 1 Tbsp. of water, and whisk to the consistency of honey, adding more water or tahini as necessary. To serve, spread the vegetables on a platter and drizzle over the sauce. Scatter the pine nuts/sesame seeds on top, followed by the za'atar and parsley. Gjelina's Roasted Yams - Happy Thanksgiving! I know it’s crazy to mess with family favorites at Thanksgiving. But if you are looking to cook up something a little different from the traditional mashed potatoes or marshmello topped sweet potatoes, this recipe from Gjelina:Cooking From Venice, California gets it right. Even if you don’t make it for Thanksgiving, try it any night of the week! It's a snap to make - Large wedges of sweet yams, tossed with olive oil, honey and espelette, and then roasted until carmelized on the edges and perfectly soft inside. I love it served with chicken, steak, or even a simple green salad for a delicious vegetarian meal. Heat oven to 425. Cut the yams lengthwise into 4 wedges per yam. Put them in a large bowl, and toss them with the honey, ½ tablespoon of the Espelette pepper or crushed red-pepper flakes and 2 tablespoons of the olive oil. Let it sit for 10 minutes or so, tossing once or twice to coat, as the oven heats. Transfer the yams to a foil-lined, rimmed baking sheet, season with salt and pepper and then bake until they are deeply caramelized around the edges and soft when pierced with a fork at their thickest part, about 30 to 35 minutes. Combine the yogurt, lime juice and remaining tablespoon of olive oil in a small bowl, and whisk to combine, then season with salt and pepper to taste. Set aside. When the yams are done, transfer them to a serving platter, drizzle the yogurt over them and garnish with the remaining Espelette pepper or red-pepper flakes, the scallions, and a pinch of salt. This is a great dinner party recipe because it’s a beautiful dish, you can do all the prep ahead, and the flavors are delicious! I love how easily this recipe comes together. Just throw everything into a big bowl to marinate. You can do this step several hours or up to a day ahead. Then transfer everything into a skillet or baking pan and roast. In a large bowl, mix the chicken with the onions, lemon, garlic, 4 tablespoons olive oil, spices, chicken broth, salt, and pepper. Leave in the fridge to marinate for at least 3 hours or overnight. Transfer the chicken and its marinade to a skillet or baking pan large enough to hold all the chicken pieces lying flat with a little space between pieces, skin side up. While the chicken is in the oven, roast the pine nuts in a small frying pan, stirring constantly, until they turn golden. To Serve: Transfer the hot chicken, onions and lemons to a serving platter. Pour pan juices over the chicken pieces. Sprinkle chicken with extra za-atar if you like and sprinkle with chopped parsley and toasted pine nuts. Serve hot. TIP: To make this dish vegan, substitute the heavy cream with coconut milk. For the parmesan, you can use Parma, or add about ¼ cup sesame seeds in place of the parmesan. 1. In a medium saucepan, heat the quinoa with 2 cups water until boiling. Reduce heat, cover and simmer until all the water is absorbed and quinoa fluffs up, about 15 minutes. Set aside. 2. Heat a large pot of water to boiling and add the broccoli. Cook just until broccoli starts to soften and is bright green. About 90 seconds. Drain broccoli and rinse with cold water to stop broccoli from continuing to cook. Set aside. 3. To make the broccoli pesto: puree 2 cups of the blanced broccoli, garlic, ⅓ cup of the almonds, 1/3 cup of the parmesan, salt and lemon juice in a food processor. Drizzle in the olive oil and cream and pulse until nearly smooth. 4. 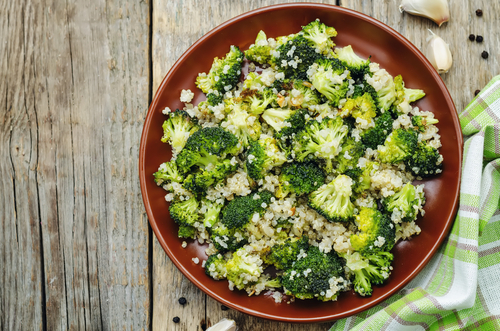 Just before serving, toss the quinoa and remaining broccoli florets with the broccoli pesto. Taste and dd more lemon juice or salt if desired. Add the remaining ⅓ cup parmesan cheese. 5. Spoon mixture onto serving platter or plates. Add toppings. I recommend sliced avocado and liberal amounts of the red chile oil. When we are talking about nutrition, essential minerals are chemical compounds that your body absorbs through food so that it can function at it’s best. Minerals perform many important tasks in the body – they help your muscles, brain, and entire central nervous system run. They help your metabolism, impact hormone regulation and build bones. Simply put, you need them, but many people don't get enough. Although I recommend taking some high quality supplements (See my recommendations HERE), as part of your health and wellness plan, the best sources for minerals are from whole foods, so you can take them as nature intended. Calcium: Green leafy vegetables kale, dairy products, almonds, chickpeas, dried fruit, flaxseeds, broccoli, bok choy, watercress. Iron: Most organic, grass-fed meats, seafood, beans, dark, leafy vegetables, raisins, dried apricots, peas. Potassium: Avocado, squash, spinach, sweet potato, wild-caught salmon, dried apricots, coconut water, white beans, bananas. Sodium: All vegetables, dairy products, meat, shellfish, salted nuts, table salt, and my favorites--sea salt and himalayan pink salt. Magnesium: Spinach, chard, pumpkin seeds, brown rice, black beans, yogurt or kefir, almonds, dark chocolate (yay! ), avocado, figs, banana. Phosphorous: Pumpkin seeds, organic meats, dairy, tofu, lentils and beans, tempeh. Sulfur: Arugula, coconut juice, milk, or oil, cruciferous vegetables (like broccoli, cauliflower, bok choy, kale, radish, watercress), dairy, garlic, dried fruits, eggs, legumes and dried beans. Chloride: table salt or sea salt, tomatoes, rye, seaweed, olives, lettuce, celery. And here is some good news if you enjoy a glass of wine....Wine (red and white) contains all 13 of the minerals necessary to sustain human life? Mineral waters also contain most, if you're not a drinker! Starting today, make sure you include more mineral-rich whole and organic items in your shopping cart. Foods like kale, dried apricots, nuts, beans, and others, contain a lot of minerals……So load up on these! Note for my vegetarian and vegan friends: Adding vitamin C-containing food with your iron-containing food can help you absorb it. For example, if you make a spinach salad, throw in some fresh orange slices, or toss your sauteed kale in fresh lemon juice. There’s just so much I love about this dish. Aside from how delicious it is, this meal is super healthy, easy to make, and can be prepared in advance. Zucchini has a high water content, making it low in calories. So, once you stuff it with some flavorful veggies and the protein rich quinoa, top with just a bit of mozzarella…...you’ve got an amazing healthy meal. This is a light dish, so I serve it with a nice big salad. If you'd like, you can try topping the zucchini boats with a bit of a light marinara sauce! To keep this vegan, eliminate the parmesan and mozzarella. In a skillet over medium high heat, add the olive oil, onion and red pepper. Reduce the heat to medium and sauté 6-8 minutes, just until the onion softens a bit. Scoop just a bit of each zucchini out with a round scoop. Chop the scooped out bits up into a small dice put the zucchini aside. Line a baking sheet with foil or parchment for easy clean up. Arrange the zucchini on the sheet. Using a small spoon divide the mixture between all of the zucchini. Cover the baking sheet with foil. You can refrigerate at this point up to a couple of days if you'd like to serve it later. Otherwise, place the sheet in the oven and bake for 30 minutes, covered. After 30 minutes, uncover and top each zucchini with some mozzarella. Place the sheet back in the oven and bake for another 10 minutes. A creamy asparagus soup with fresh herbs and tangy lemon juice - the perfect soup for spring! Not only is this soup incredibly flavorful and creamy, but it also happens to be really easy to prepare - and contains just a handful of ingredients. Enjoy this beautiful soup with a piece of crusty bread and a small side salad for a light and healthy meal. In a large pot, heat the canola oil over medium-high heat. Add the diced onion and sauté until soft and translucent (6 to 8 minutes). Add in the chopped asparagus and sauté another 2 minutes. Add 2 cups of vegetable broth to the pan and simmer over low-medium heat for 5 minutes, or until the asparagus is slightly tender. Remove from heat and allow to cool slightly. Add in the salt, pepper and fresh herbs. Blend another minute or so until the soup is creamy and smooth. Taste and season further. Re-heat soup in same pot, otherwise it's great at room temperature. Serve with a crusty piece of bread. Asparagus is s a very good source of fiber, folate, vitamins A, C, E and K, as well as chromium, a trace mineral that helps balance blood sugar. It's one of the top ranked vegetables for its ability to neutralize cell-damaging free radicals. This may help slow the aging process and reduce inflammation. Another anti-aging property of this delicious spring veggie is that it may help our brains fight cognitive decline. Like leafy greens, asparagus delivers folate, which works with vitamin B12—found in fish, poultry, meat and dairy—to help prevent cognitive impairment. In a study from Tufts University, older adults with healthy levels of folate and B12 performed better on a test of response speed and mental flexibility. (If you’re 50-plus, be sure you’re getting enough B12: your ability to absorb it decreases with age. Sometimes you need an energy boost…and sometimes you just need chocolate. Healthier Hot Chocolate: A rich and creamy chocolate treat, free of dairy and refined cane sugar. Combine all the ingredients into a saucepan over high heat. Keep stirring with a whisk until piping hot (avoid boiling). Serve with a few marshmallows for a special treat. Studies have shown that cocoa powder is associated with decreased blood pressure and improved cholesterol levels. These heart healthy benefits can be attributed to the flavonoids, powerful antioxidants, found in cocoa. Cocoa powder also contains important minerals like copper, manganese, iron, phosphorus, and zinc. Cinnamon contains essential oils with many health benefits and adds a delicious nutty flavor. 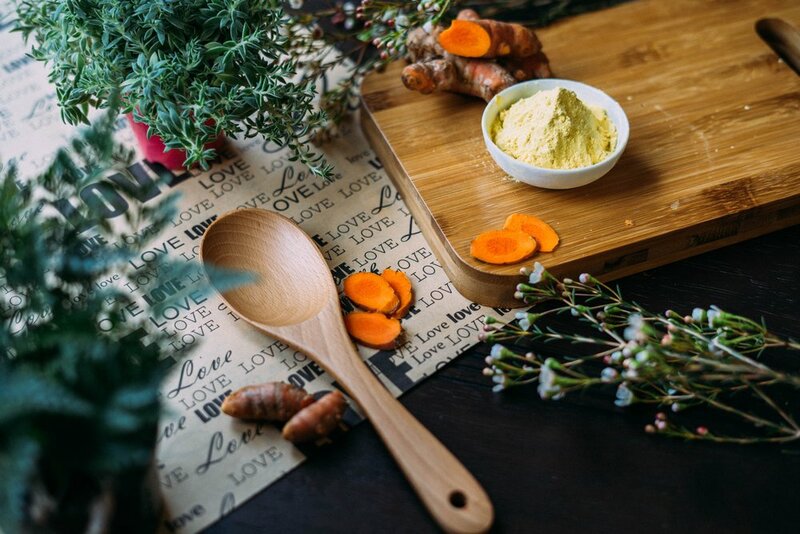 Recipe inspiration from this wonderful hostess and healthy mama! My sweet friend and partner, Kelly Hollins. That is why it is so important that what we put on our skin is 100% non-toxic. The reality is that companies are allowed to use known toxins — ingredients that have been linked to cancer, reproductive issues, and hormone disruption — without even disclosing these ingredients to us! About a year ago, I was reading a wellness blog by Kris Carr (she is a wellness advocate, writer, cancer survivor) about the toxic ingredients used in skin care products and the lack of regulation in the beauty industry, and her words really resonated. Here I am, working so hard to be the healthiest I can be, dedicating so much time and energy to good nutrition and exercise, yet I’m using skincare products that are full of toxic chemicals. And I’m absorbing them right through my skin. Beautycounter: Skincare with a conscience. That’s when I discovered Beautycounter: a skincare and cosmetics company that’s dedicated to only using safe/non-toxic, but effective ingredients in all their products. 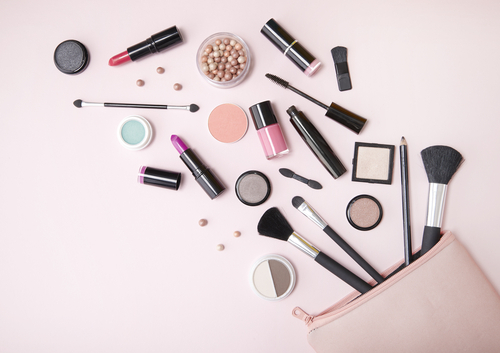 Better yet, they’re working to help facilitate legislation that would mandate regulations for the cosmetics industry and prevent the use of unsafe ingredients in skincare and makeup products. Did you know? It’s all in the numbers. The United States has not regulated the cosmetics industry since 1938. Companies can pretty much do whatever they want. We have introduced over 85,000 chemicals into commerce since World War II. Of these, almost 80% have never been tested for safety. Europe has banned 1,300 harmful chemicals from use in skincare products. The United States has banned only 11. Beautycounter compiled a list of almost 1,500 ingredients they have determined as unsafe and will not use them in their products. Yet their products are still 100% effective! 1) These products work. Unlike many of the “organic” or “natural” products I’ve tried, these products work. Just because a product says it’s organic or all natural doesn’t necessarily mean anything. For example, a skin care product can contain only 1% organic ingredients, and the manufacturer can legally call this product “organic”. Plus, organic products don’t have a very long shelf life, which is not ideal when you’re spending money on quality skincare products (but that’s a blog topic we’ll save for another day). 2) I feel good knowing that what I’m putting on my skin (and into my body) is safe. All of Beautycounter’s products are rated between 0-2 on EWG’s Skindeep database, which rates product safety. 3) I love supporting a company that is doing their part to make the world a better (and safer) place. 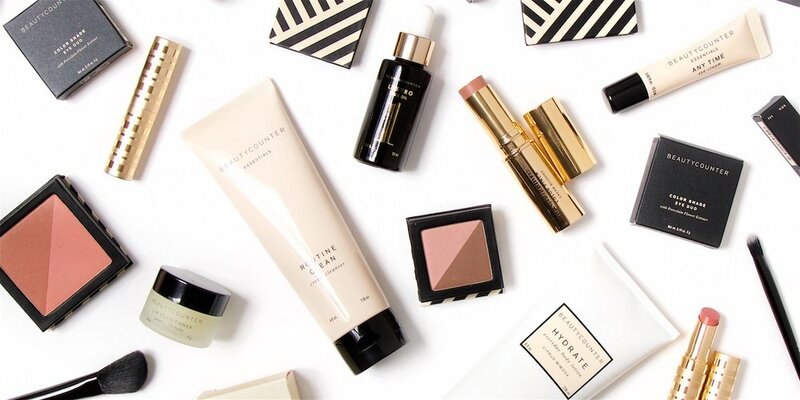 Beautycounter is lobbying in Washington to reform the current laws and impose the stricter guidelines they have chosen to follow. They also work with non-profit organizations that are working to reduce our amount of chemical exposure. 4) I want you to feel good from the inside out. I would never have taken on a beauty and cosmetics line if I didn’t feel passionate about it. These products compliment the work I do on so many levels. Looking good, and feeling good, go hand in hand. Hi Friends! I have found the most effective and natural way to cleanse and moisturize my skin! I have to admit, I was skeptical before I first tried putting an oil directly on my face. I wasn’t sure it would work well for me. I have had problems with rosacea in the past and I was afraid that a face oil would cause breakouts........I was wrong! My skin has never looked more soft, radiant and "glowy"
These products are a staple for me because they contain a unique combination of wonderful "nourishing botanicals" and it’s from a brand I know, trust and love. Beautycounter is a company that is dedicated to bringing safe and high performing products to the beauty industry. Here are my favorite skin care products! I know they will give your cleansing and moisturizing routine a beautiful boost. The simplest way to moisturize skin and boost radiance, this silky formula contains a luxurious blend of pure plant oils. Unlike synthetic oils, which can sit on skin, our Lustro Face Oil is easily absorbed for the ultimate in hydration. Lustro Face Oil 2 contains jasmine oil, an ingredient that adds a subtly sweet floral scent and helps improve skin's elasticity, making this formula a great option for anyone with dry or mature skin. This best-selling balm melts into your skin to hydrate while it cleanses, removing makeup and other impurities but never stripping away moisture. With vitamin C to brighten skin and raspberry and cranberry seed oils to hydrate, the formula can also be used as an intensely nourishing face mask.